Located 110km southeast of Mariental, the little town of Gochas can be considered one of the smallest in Namibia. Even though only a few shops, houses and structures mark its existence, Gochas is a lovely break from the rushed pace of the larger towns and attractions. 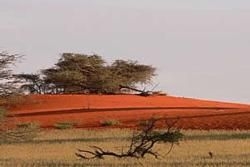 The surrounding area expresses the Kalahari in known beauty of rolling red dunes, golden tufts of grass and green splotches of shrubs and trees with the dry riverbeds offering a stark contrast of white. The history of the town is not well known, but there are a few WWI graves to visit and the Fish River Canyon lies within reach. Wildlife in the area abounds in herds of springbok, oryx and red hartebeest with black-backed jackals, caracals and the occasional brown hyena adding on the predator side. Cheetahs are also known to roam the plains while the nocturnal aardwolf can be spotted making its way through the grasses in search of nourishment.